Discover 2 ways to help protect property inside your storage container. 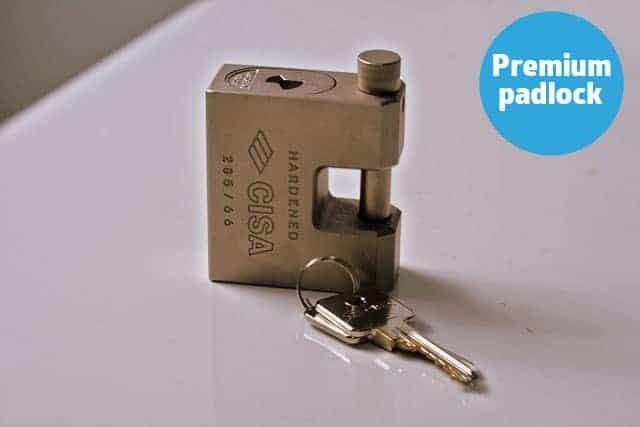 If you are keeping anything of any value inside a storage container you may be wondering how to help protect your property, introducing the CISA 285/66 container padlock. Each container padlock is supplied with 2 sturdy keys so you have a backup copy if needed. Although the CISA padlock is robust, what if someone very determined was trying to break into your padlock – is there another layer of protection that you could add? Fortunately there is, and it’s the container lockbox. Essentially the lockbox helps protect your padlock by housing it inside a steel box which is securely welded to the container. The idea behind the lockbox is that it makes it more difficult for any would be thieves to gain access your lock with an angle grinder for example. You can read more about the lockbox here. By combining both the CISA shackle 285/66 padlock and lockbox you have added 2 layers of security to your container – which will help protect what you’re storing inside. Shipping containers are an extremely popular choice for storage, but why? Containers are made from durable corten steel so are designed to endure tough conditions at sea. With minimal maintenance the average container has a long lifespan. Compared to the sq. foot cost of a traditional building or even non traditional structures (such as a wooden shed) containers are great value for money. Check prices here. If you want to move your stored goods to another location or no longer need the extra storage space it’s as simple as lifting the container up and transporting it. Easy. We make buying a container affordable for you by offering a range of quality new and used containers to choose from. All are priced very competitively but if your budget is stretched then take a look at our quality second hand containers or maybe consider hiring instead? 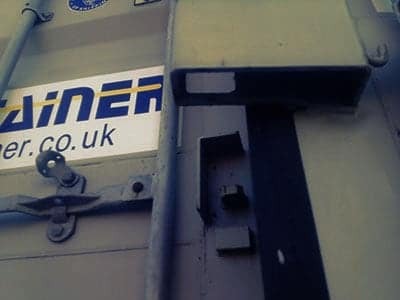 Short and long term storage container hire is available to you across the UK because we have depots spread out across the country. This means getting a container that is closer to you is easier so you get faster delivery and lower transport costs. How could modifying your container optimise storage use for you – or your self-store customers? Maybe you have seen some of the creative uses applied to converted shipping containers. If buying a shipping container then we can modify or convert it in almost any way. If you intend to use for storage then maybe you want an extra loading side door added or partition wall – to divide space within the container. Other popular modifications include adding shelving or lights for example. We can help you with all this, and more. Although an extreme add-on, and not normally required, you could go one stage further in terms of security and ask us to install CCTV inside of the container unit. However, most customers feel their security is at a level they are comfortable with by using a combination of the CISA 285/66 padlock and lockbox.